For the last few weeks I’ve been testing the “OXX Digital Classic” which features DAB+ Digital Radio, 4 line display screen, free access to 1000’s of WiFi streaming radio stations, LAN network port and the choice of a stylish piano black or ivory white timber cabinet. Note : I’ve seen it on sale for $270 to $299 so make sure you search around when deciding where to buy it. It’s clearly had a lot of thought put into the design so its worth buying if you value aesthetics and a manufacturer who puts thought into little useful features like a backlight whose brightness level can be changed & LAN Port for people without WiFi router. Styling: Shiny Piano black or Ivory white timber cabinet with matching coloured buttons, Volume and Tuner/Select Knobs. Silver trim on front of cabinet. I’d buy a black coloured unit personally but you may think differently depending on the decor of your living room. Antenna: Same length as all the other digital radio units I’ve tested to date (except the Kogan which has a 10cm longer antenna). OXX Digital says they’re considering a longer antenna in future batches made at their factory. Warranty : Generous 2 year (24 Months), most consumer electronics products only have a 1 year warranty. Free Firmware updates over the internet. Display : 4 lines with scrolling information at a smooth pace, not too fast or slow. Most units around this price only have 2 line displays, 4 lines makes it much easier to scroll and view menu options for radio stations, mp3 lists on network drives etc. User settable different backlight levels for playback and snooze mode is a nice touch so it doesn’t glow at night time when you can use it as an alarm clock. Buttons : Do the job but not very big so it can be a little tricky to differentiate between them with fingers in the dark. Adding little tactile “braille style” pips on the important buttons like “Power”, “Info” and “Mode” would be helpful. The “Info” button is useful because it cycles between Signal Strength, Bitrate, scrolling datastream (news updates, current song) etc. 4 preset station buttons can each store a favourite Digital/FM/Internet radio station. DAB+ Radio : Picked up all the Sydney stations and displayed the digital radio station datastream eg: current song name, weather forecast, news headlines etc. There isn’t much sound difference between FM analog radio and digital radio in my opinion but digital radio stations which used to be AM stations sound much better. Another benefit of digital radio is new stations like ABC Grandstand Sports, NovaNation, SBS6 (BBC World Service), TheEdgeDigital etc. Connectivity : I like the LAN port which is a rare feature on a digital radio. Not only does it load internet radio instantly with no buffer delay time but there’s no need to enter WiFi router security settings like SSID, WPA2 passwords etc. For those who prefer wireless networks WiFi 802.11b/g is supported with WEP/WPA/WPA2 security support. WiFi Radio streaming: Worked fine and it was easy to use the tuner knob to navigate the countless (1000’s?) of different streaming radio stations worldwide from big broadcasters like BBC, NPR etc as well as the independent music and other online radio stations. Streaming Playback from Network Storage : Shared Folder MP3’s from home network were easy to access and navigation around subfolders using the large select Knob and “Back button” was smooth. Unfortunately not possible to play Random/Shuffle. OXX Digital says they will see if this is possible in future batches made at their factory. Speaker: 5W RMS Mono. Quite good enough for listening to spoken voice podcasts and talk radio, OK for music if you’re not an audiophile. Strong enough to turn up the volume and listen from across a big open area without distortion. Suggest plugging in a proper surround sound system/stereo speakers into the headphone jack if you listen to music often. Output stereo 3.5mm headphone jack: Instantly switches audio output to external speakers/headphone as soon as they’re plugged into the radio. I just picked up an @oxxdigital and I completely love it, it’s a glorious device. Very intuitive, all set up, no need for manual. 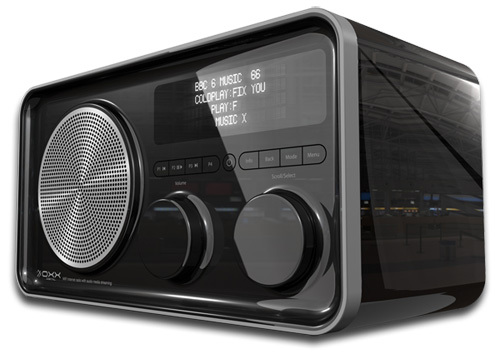 The OXX Digital Classic DAB+ Digital Radio has clearly had a lot of thought put into the design so its worth buying if you value aesthetics and a manufacturer who puts thought into little useful features. It is great for playing MP3’s that you have stored on your home network. But, it would be nice if it had a shuffle feature like any traditional MP3 player would. Still a solid unit though. For a device that is 5 watss (RMS ?) mono its WAY too over priced. Something like that should be $100 max . CharliebrownAU – Are you seriously asking for HDMI and DVD Drive on a digital radio? You want a device that plays CD and DVD, plus media files? Buy a Mac! A radio is a radio! They are overpriced and limited. I agree charlie, Apples are way overpriced. On topic that thing looks sick! Any one else had problems with RF sensitivity? Just received the OXX Classic DAB+, ordered last week with great anticipation, for listening to DAB+ and Wireless Internet Radio. To my extreme disappointment both the DAB+ and WLAN sensitivity is extremely poor which I hope is related to a faulty unit. One DAB+ channel was found though due to low signal would not play and the WLAN functionality only works as long the unit is within 4 meters of the router. Looking forward to see the feedback from the oxx email support. I understand you are in contact with our tech team. Feedback , Good or Bad is valuable to us. With regards to FM functionality, can you be more specific, as when you push in the scroll/select knob on our Classic unit in FM mode it scans as you would expect? is there something other function you required? To date we have had very few issues with Wireless issues but having a WiFi unit of course opens any manufacturer up to a myriad of issues sometimes, unexplainable. I would expect our teach team will ask for the unit back so we can test it ourselves. With regards to DAB+ signal, we are of course subject to the available signal strength but we are trialling a different Antenna for those people in weaker signal areas and they tech team may respond in this way. I live outside the metro area of Sydney and all we receive at present is the ABC on our clock radio. Internet radio to wake up to, would be great. With wireless will it transmit through a couple of walls to our bedroom??? I don’t have a laptop to check. Running a computer cable would be difficult. I assume I would have to buy a wireless router as well. I’ve been in touch with Oxx Tech support as my unit kept on freezing and I had to reboot the device to get it working again. All buttons were unresponsive while it froze. (it looks like the unit freezes if you auto update the date/time from DAB singal). The screen also stopped working so I could not operate the device. I had to first persuade them to send me a new unit as their policy is not to send out a replacement unit until they find the issue with the faulty unit. This could have taken weeks or months as they had to test the unit first. I set the new one to auto update date/time from Network, which has ben much more stable, but it still loses the time (display resets to all zero’s) about once per week. Oh, did I say I actually love the unit. It looks great, sounds great and hooks up to my internet connection without fail and gives me access to all my hometown stations on the other side of the world. Please Oxx, fix up the firmware so that we can enjoy this unit as it was intended. I can’t keep oversleeping and missing my early morning surf due to failures of the clock. Oh, and one other thing, you can’t alter the volume setting on the preset 2 alarms, like it says you can in the manual. The volume is simply what you left the device on the last time you listened. This is a bit of a game of roulette if you cranked the unit up the afternoon before and forget about the volume setting. The alarm going off at 6am at full volume is real heart attack material! We of course take note of all feedback on forums and blogs and sorry to hear you are having some intermittent issues. In the background we are working with the chipmaker (Frontier Silicon) who do all the R&D for such issues. The biggest problem we faced that it has been very hard to replicate the fault and it took about 4 weeks for us to do that and Frontier even longer. I have been keeping tabs on this and learnt last night that Frontier have an updated version of the software for us to try. No doubt our techs will be trialling this very soon and of course will utilise a client who is having this issue (note there are about 4 people nationally we know of). Re your original radio, weirdly the display never did fault after us testing it for 4 weeks nor did it freeze at our location and in fact we sold that as a refurb with no comeback on the display or freezing…The joys of technology. Glad you like the unit and I have raised the volume/manual issue with our tech team to look at and work on. Cheers and someone will no doubt one of the guys will be in touch. I’m ready to buy one for my Mum! I have adjusted the backlight to low but then the backlight disappeared altogether. Now I can’t see the menu and I can’t adjust anything. Help! and the tech team will assist. Hi all, I bought my wife a ‘Classic’ for her birthday and set it up for her. Looking through the above posts I would agree that there is a problem with having the time updated from dab [unit froze and required a reset three times] and I have now set it to update from the network. Also the dim setting for the screen is way too dim as I have to use a torch to see it. I also find the dab reception weak and need to move the antenna around to get it to stop fading in and out. On my wish list I would have liked the option to have the sleep setting remain active. Other than the above we both love this thing. Oh, before anyone asks, I have not contacted Oxx support as we have only had the unit two days and I have been keeping an eye on the FAQ on the Oxx AU web site re any fixes or other advice. The techs have some info on this rare freezing issue and the weak DAB signal could be connected. Which suburb/ state are you in by the way? Further to my post above, the problems I mentioned were resolved a couple of months ago and the unit is now “rock solid” even resetting its self after a poweroutage which we are prone too [possums]. The sound is better to us than other Dab+ radios that we have heard and we would recommend it to anyone looking for a digital radio. Hi I have the same problem with a very dim display. It is on the highest setting, and was very bright when I bought it but i now need a torch to see it in day light. b) fill in our support form so we can help. Hi We have just bought an oXX classic and love the look and the sound … except there is a constant low humm. (Humm does not increase with the volume going up stays the same – its an electrical sounding hum/buz lowish freq)… I have tried it all over the house and the hum continues – so figure its something to do with the power supply of the oxx … Has anyone had similar problems – I will take it back tomorrow. I took it back and they replaced it. Took it home plugged it in and Hummm even worse than the first. So took it next door in case it was the wiring in my house. Plugged it in and again hummmm. The hum is there except web radio is in standby. With station selected Internet or DAB when there is no volume very audible Hummm . Not sure I want to persevere with the oxx even though it looks great and part from the hum seems to work really well. Any advice as to what I should do?? Sorry to hear you have an issue and twice is very odd. I just spoke to our techs and they have encountered this issue once or twice but not regularly over the last few years. Please submit your issue on our website, http://www.oxxdigital.com/au/emailsupport.aspx and it will be dealt with accordingly. I would think they will get you to ship it back to us at our cost and replace it immediately and test your unit to ascertain how and why that issues has happened. i bought oxx 3day ago and DAB radio was working for 1 an hour and stop since than. I tryed everything, changed location but doesnt work. I purchased an OXX for the DAB, however at my house in Sydney it doesnt pick up anything. Thank heavens for the internet radio, which worked fine ( still does) except that the ABC during the Olympics stopped all internet radio, and now the Olympics are over the stations never returned. So all the ABC internet stations just beep now. So my radio although beautiful, basically doesnt work. Just in case you still reading on this site, I have OXX Digital Classic which was bought in Australia. Unfortunately it looks like the power supply has failed after about a year or so. Can you let me know if this can be replaced and if not, can you give me some specs on the power supply ( VOLTS/ CURRENT ) so that I can replace it with a plug pack power supply. I’ve tried to get onto the OZ support site but keep getting 404 error . Also, the OXX support on the net haven’t replied to my emails for support on this issue. Would appreciate your help if you happen to read this email. Read the note from Tom to Geremy re failed pwer suppy .. I may have the same problem .. any joy on info re the power suppy voltage/current rating? I, too, have a Classic that I bought in 2012. I was very happy with it until the volume disappeared. Display is fine and the time setting. Looks like it has channels tuned in and displays info from them, but no volume. I’m very disappointed. The website doesn’t seem to be operating for support and the phone number in the telephone book is no longer connected. Is there any support anywhere or has anyone else experienced the same issue. case the OS is not beeing correctly loaded? The back light on my OXX Classic is not working so I cannot use, How do I this fixed? My blue light doesn’t work anymore. Can anyone help me.